FPV (first person view) can be quite technical and confusing, especially for those just setting out in the hobby. To simplify things, we've put together this FPV bundle. It’s all plug and play and fully compatible, so no soldering or guesswork is required. The kit comes with everything you need to get up and running except for a display - for that you’ll need something like a 7inch FPV monitor or goggles. 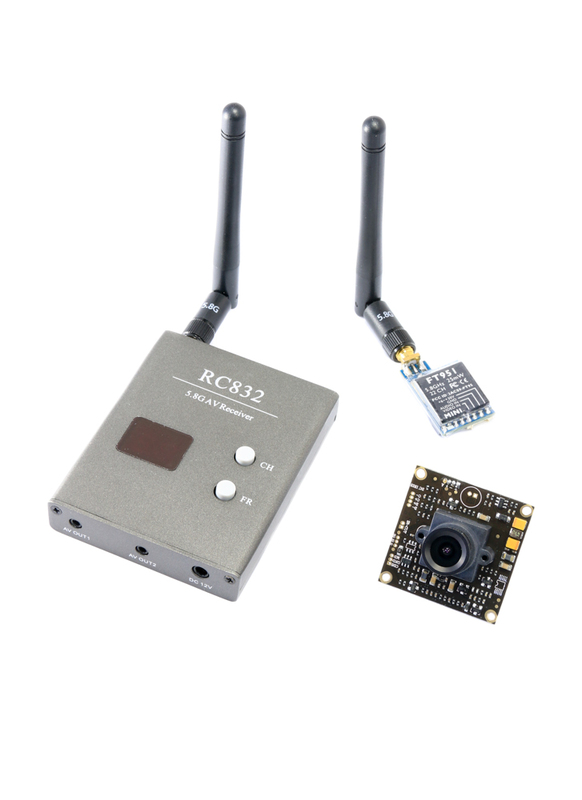 The kit includes a FPV camera, video transmitter (Tx) and video receiver (Rx). The camera is a high quality Sony CCD 700TVL board camera, which actually works in changeable light levels unlike many cheap CMOS cameras that 'black out' when pointing at the sun. The receiver is the easy to operate Boscam RC832. It boasts 40-channels over 5 bands, making it compatible with most FPV gear on the market. Finally the kit offers a choice of 5.8Ghz video transmitters (please select as required). The FPV transmitters to choose between are the FT915 UK legal 25mW Tx, good for at least 200m in open space; the FT952 200mW Tx, good for 500m line of sight and finally the professional FT956 Tx which has a variable power output ranging from the UK legal 25mW limit to a massive 800mW for a very long range. All of the gear operates on 12V DC (3S LiPo) and have JST female power plugs. We sell a useful adapter that lets you power the setup directly from your 3S LiPo's balance lead. Would this product work wit the Quanum V2 goggles from Hobbyking? Hi, yes, 100% compatible. If you need the Quanum V2 goggles, I have them available for £49. Hi Steve, the goggles aren't listed on my website at the moment. I could do them for £45. If that's ok, please email me at info@flyingtech.co.uk and then I'll email you back a payment link for that order.